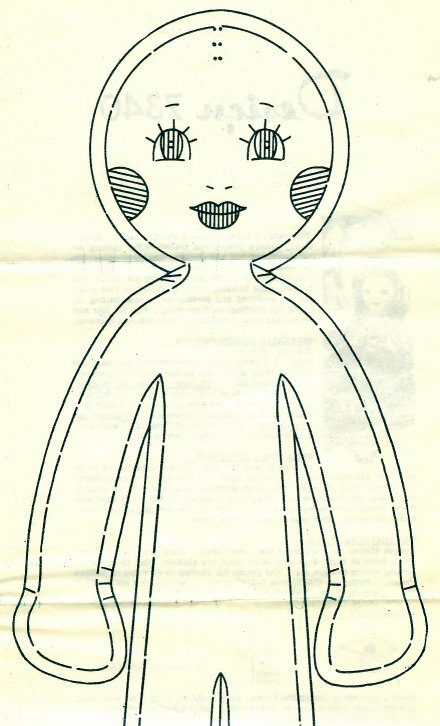 Design 7340 is a mail order pattern to make an Old Fashioned doll about 14" tall. 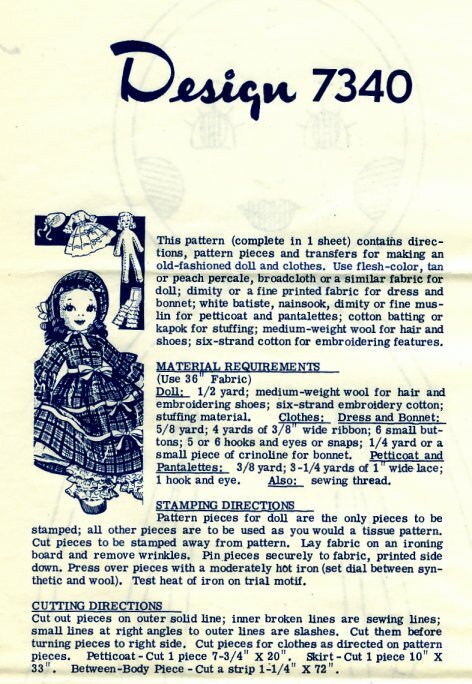 The pattern is undated, but the instructions calling for kapok to be used for stuffing and wool for the hair implies it was issued in the '50s or earlier, before synthetics were commonly used. The pattern and instructions are all on one sheet. The doll pattern pieces are a transfer, to be stamped on fabric and then cut out, but the clothing pieces are meant to be cut out and used like a tissue pattern. One piece is given for the front of the doll and one for the back, but the instructions call for a strip of fabric to be sewn in between the two halves, all around the doll, to make her more three dimensional. The back of the doll's head has darts to give it some roundness. She has embroidered features and yarn hair. The instructions illustrate wrapping the yarn around a pencil to make curls. The doll wears a dress trimmed with self ruffles on the sleeves and ribbon bows, matching bonnet, petticoat and pantalettes trimmed with lace. Her shoes are embroidered onto her feet. I love this doll's face. This is one I'd like to make.